We've featured many USB microphones in the past, capable of capturing great quality audio for your digital projects. However, we've never featured a home recording set up quite so comprehensive as this. Filled with everything you need to record professional quality music and vocals, we take a look (and listen) at the Tascam Trackpack 2x2. If you've been wanting to get your band, audio book, or podcast project off the ground, and have been busily hunting around for a decent microphone, a sound pair of headphones, and high-quality audio software, look no further. 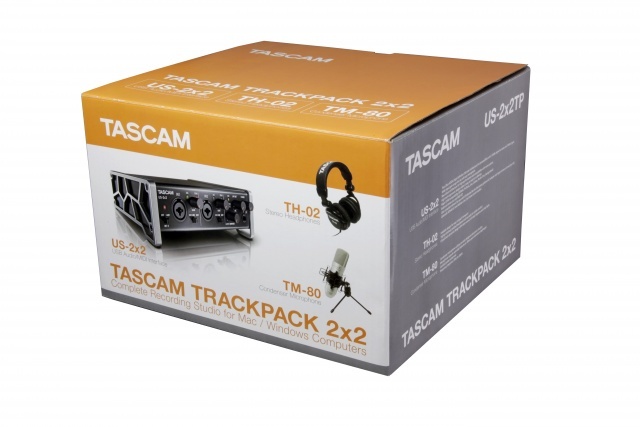 The Trackpack 2x2 contains everything you need, including both a mic and headphones, as well as an audio interface and even recording and editing software. If all this sounds a tad intimidating, trust us; it really isn't. 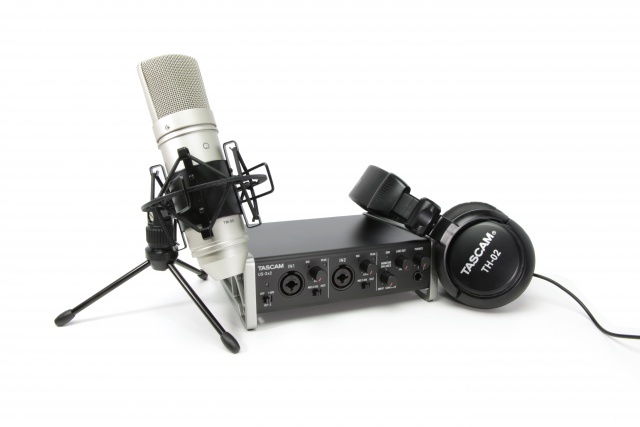 The interface unit, the Tascam US 2x2 connects to you Mac or PC via good ol' USB just like a stand-alone USB microphone, and then you connect the microphone and headphones to that, giving you full and – crucially – tactile control over both. The US 2x2 is nicely crafted as well, with solid aluminium sides that not only make it exceptionally sturdy and rugged (good for lugging around in your bag to your next recording location) but they also serve to angle the unit upwards, making easier and more comfortable to operate on a desktop. The business end of the set has to be the TM-80 Condenser Microphone. This gorgeous looking bit of kit is fully metal, has been designed to be small and sleek, and includes a shock-mount on mini tripod, as well as a six-foot mic cable. The TM-80 is perfect for capturing vocals and instrumental music, but can also be exposed to far louder sounds thanks to the maximum sound pressure rating of 136dB SPL. So grab your axe and turn it up to 11. Finally in the hardware line-up is the TH-02 Headphones. These are very comfortable over-ear headphones with a good flexible band and cans that can rotate all the way up (making them easier to pack up and carry). These are studio-grade 'phones, so feature the large-size phone jack (which doesn't therefore plug into your phone) and soundproof cushion muffs to stop bleed from the cans leaking into the mic. Also included, and available as two separate downloads, are Cakewalk SONAR X3 LE and Ableton Live Lite 9 DAW software packages. You simply get two small cards included in the Trackpack which give you download details and a redemption code. Both downloads are 'lite' versions of the full programmes, but offer enough functionality to get you started, recording, and editing. Hooking everything together was a cinch, and we're not joking when we say that using this kit is just as easy as a single microphone. The immediate benefits that we found was the ability to listen to what was being recorded as it was recording, as this is not a feature that most USB mics offer. Gain control over the input was also great, and its nice to be able to alter things like this as it happens, and not have to worry about fixing it during editing – a time consuming task indeed. Once free of the chunky packaging, where each individual element is packaged separately, the whole kit is actually very mobile. Even the US 2x2 interface device is small and light enough not to be a drag in a bag, so taking the lot, along with your laptop (or indeed iPad – it's iOS compatible), is extremely doable. 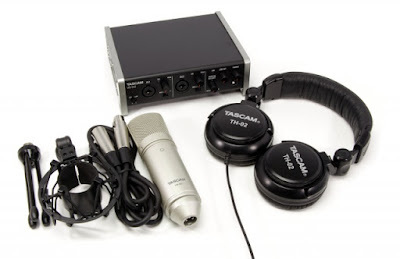 Great for aspiring musicians and podcasters, there's a lot of value in this set so do check it out.